"Shalom rav al Yisrael am'cha tasim l'olam"
"I am very positive in everything I say. But I am most positive in regard to the great benefit of these ten Psalms." "These are the ten Psalms: 16, 32, 41, 42, 59, 77, 90, 105, 137, 150." "This is the General Remedy. There is a specific remedy for each sin, but this is the general remedy." "Go out and spread the teaching of the ten Psalms to all men." "It may seem like an easy thing to say ten Psalms. But it will actually be very difficult in practice." For "supernatural" results: 121, 130 or 142 - all three Psalms have eight verses, eight represents "Above Nature" - the time of Moshiach. Deborah, you don't even know how much you help people with what you do. My children and I are Noahides. Both my children have autism. My daughter, in particular, suffers great anxiety and insomnia from her autism. I have been teaching her to say the Psalms. Yesterday, she was spiraling into a meltdown when I convinced her to read the Psalms of the Tikun Klali, when she finished, she said that her heart felt much better. This guide that you just posted will be very helpful. Thank you so much. As for me, Deborah, your blog gives me hope. There are struggles in my life (like in everyone's life) and I am raising my two children alone since my husband divorced me and started a new family several states away from us. If Hashem wanted to reward me in Olam Habah for not giving up and meeting my challenges, then I am certain half of the reward would need to be given to you. Your blog strengthens me, and when the flame of my nefesh is about exti guished from sadness, I can read your posts and then go back as a bright flame to love and care for my children and teach them about the Ayn Sof. If I have not expressed my thoughts well, please forgive me, I was crying when I wrote this because your post has given me just what I need to help my daughter at just the right time. May Hashem bless and keep you, may He strengthen you, may your name be great in Israel, may Hashem guard your steps so that you are always protected from danger and may He guard you from the ein ha ra. That is the most beautiful comment I have ever received. 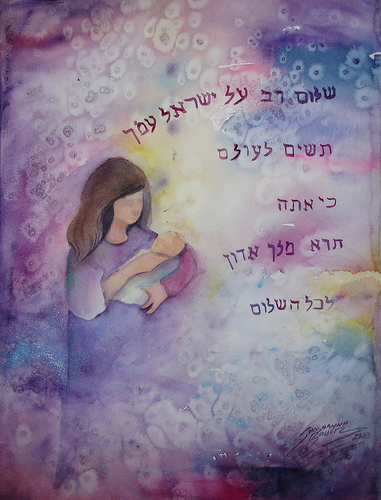 Hashem chooses special souls to care for special children. I am humbled that I have helped you in some way. Thank you for writing and I wish you only good and continued strength to do YOUR holy work. Thank you again. Devorah, you are very special and blessed. You have helped many of us Jews and Noahides. Noahide i am too. like anon at 1.08 Am. reading your comment, Anon, you have helped me.. sometimes i just tend to focus on my own problems, then here comes a comment that stops me from focusing only on .. me, my, self poor me..
Devorah, you see how special your blog is, because of this special place, i call this and like these blogs, Oasis for those of us hungry , searching for spiritual truth. G-d bless you Anon, i will try, Bli neder to keep you in prayers, i do not know you, but Hashem knows us all , by name. thank you Devorah. Hashem bless you. thank you Anon.. Hashem bless you and your beautiful children with all good things .Amen and amen. @Devorah please help me with Psalms and Torah for the following prayers:1.Prayer aginst sorcery and to overcome witchcraft and evil spirits.2.Prayer against and overcome strong enemies.3.Prayer to kill an enemy.4.Prayer to cure incurable diseases.5.Prayer against gun and war time.6.General prayer for blessings,money and prosperity.Also prayer to overcome debts.6.Specific prayer to get a good wife.Thanks and God bless. Rebbe Nachman advises the General Remedy for all things are these 10 Psalms: Numbers: 16, 32, 41, 42, 59, 77, 90, 105, 137, 150. You can say these 10 Psalms and add your own words for your own needs, praying directly to Hashem, no intermediaries. At least,I need to connect with a Kabballah/Cabballah. 4.Do not engage in illicit sexual relations. 6.Do not eat from a live animal. 7.Establish courts/legal system to ensure obedience to said laws. This is the way to connect to God. Iranian Video: "Mahdi is Near"
First Libya, then Israel .....?